Passionfruit Curd - Tangy, Smooth and So Delicious. 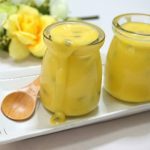 Passionfruit curd- It’s Smooth, tangy with a little sweetness. Making this curd reminds me of summer and all things happy. Its vibrant colors make it a good pairing to desserts and cakes. I like to use this passionfruit curd in my greek yogurt. It’s like the best combination ever. When I had some left over passionfruit , I did not know what to do with them so I scooped the excess out into a these cute little glass storage jars and mixed it together with my favourite Farmers Union greek yogurt. I left the yogurt and passionfruit pulp overnight and it was heavenly the next day. The perfect healthy breakfast. You can add a little cornflakes or granola for added crunch. Combine all the ingredients in a heat-proof bowl and set it over a bowl of simmering water. Transfer the curd to clean storage jars and keep in the fridge for up to 2-3 weeks. *Refrigerate curd for at least 2-3 hours to set or overnight. Prep time does not include setting the curd. This was my first attempt at curd and it turned out fabulous. Thank you posting the recipe will be using this again and again when I have a glut of passionfruit on my vine.